Educational programmes at the Chestnut Community Centre in profile. Pyramid Health and Social Care Association (PHASCA) – AGM Tue 26th June 2018 – Chestnuts Community Centre. 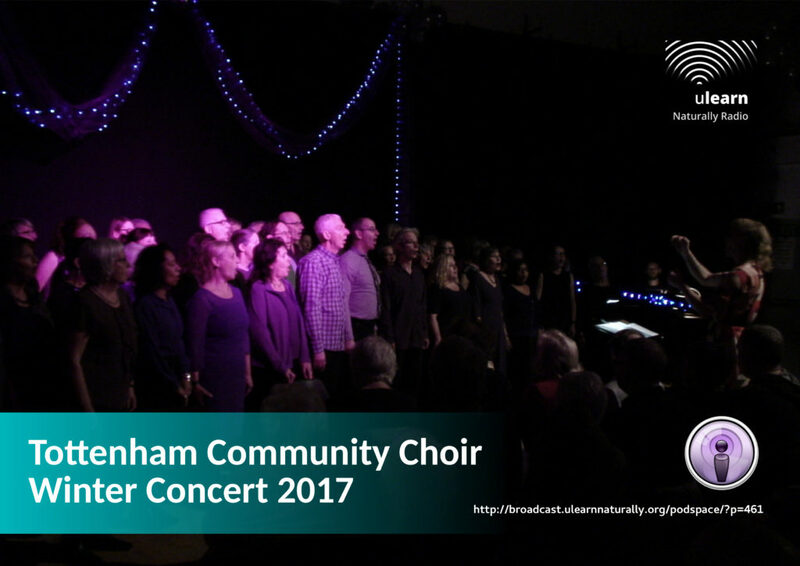 uLearn Naturally Radio joined our friends at the Chestnuts Community Centre for the very wonderful annual Tottenham Community Choir Winter Concert. The event took place on December 3, 2017 from 4:30pm to 6:30pm. 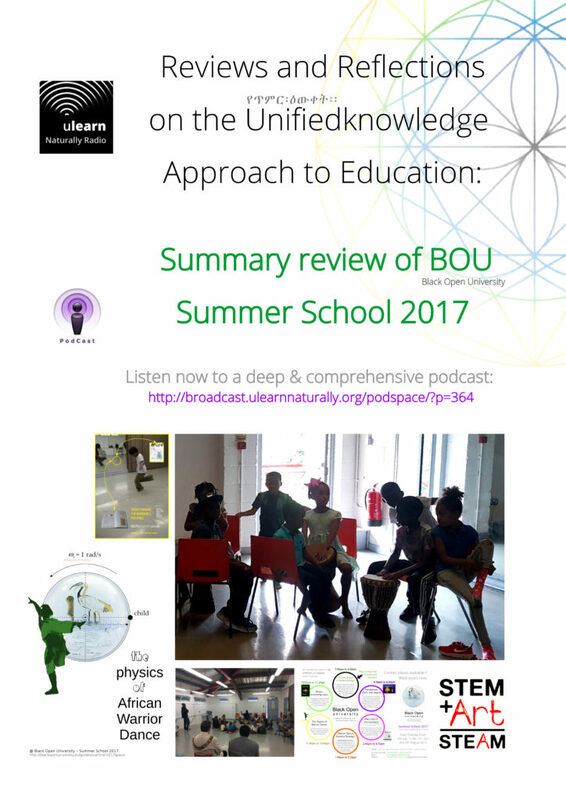 There were several supporting performances and presentations including a crowd wooing presentation by Astehmari Batekun on Binary Drumming (STEM +the Arts – STEAM Learning). 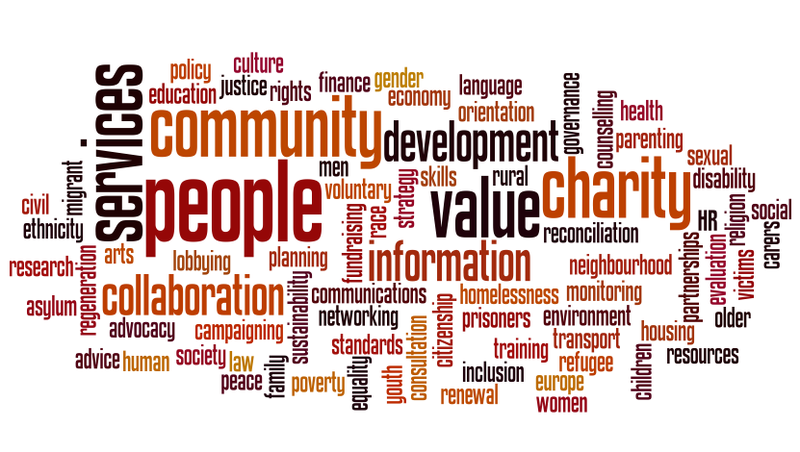 Community voices liberated to great effect. Enjoy the full concert here. 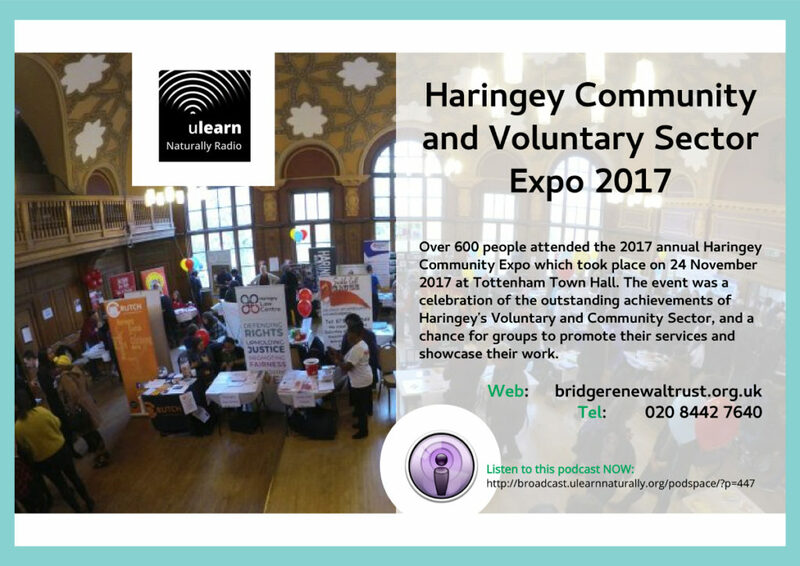 Over 600 people attended the 2017 annual Haringey Community Expo which took place on 24 November 2017 at Tottenham Town Hall. The event was a celebration of the outstanding achievements of Haringey’s Voluntary and Community Sector, and a chance for groups to promote their services and showcase their work. Over 40 organisations exhibited their work in the main Hall, letting the public know about the activities they could get involved with and signing up volunteers. The event also featured performances and exhibitions, as well a workshop from London Sport on setting up a physical activity project. Central to the day were two discussion panels featuring local experts and decision makers, the first covering the topic of Community Safety and Knife Crime and the second on Local Giving in Haringey. Members of the public and representatives from local organisations were able to hear panellists’ perspectives on these pertinent topics, as well as ask questions and make suggestions. This contributed to two highly engaging and productive sessions with valuable contributions from participants. 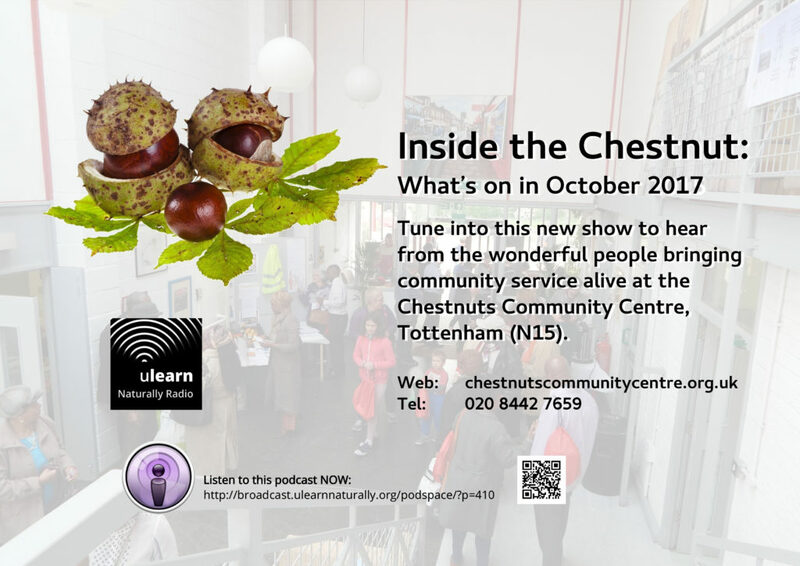 Tune into this new monthly show to hear from the wonderful people bringing community service alive at the Chestnuts Community Centre, Tottenham (N15). Find out more about the Black Open University – Open Day 2017 – 14th Oct 2017 @ Chestnuts Community Centre. 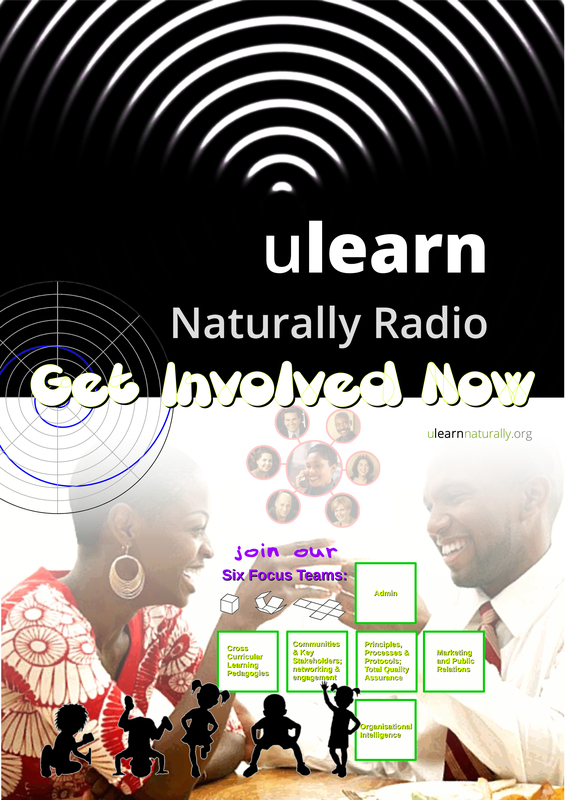 For more info on Level Being 9 – uLearn Naturally Maths – Preparations for Mastery visit abundancecentre.org. For more info on the Dark & Wild Gathering visit abundancecentre.org. 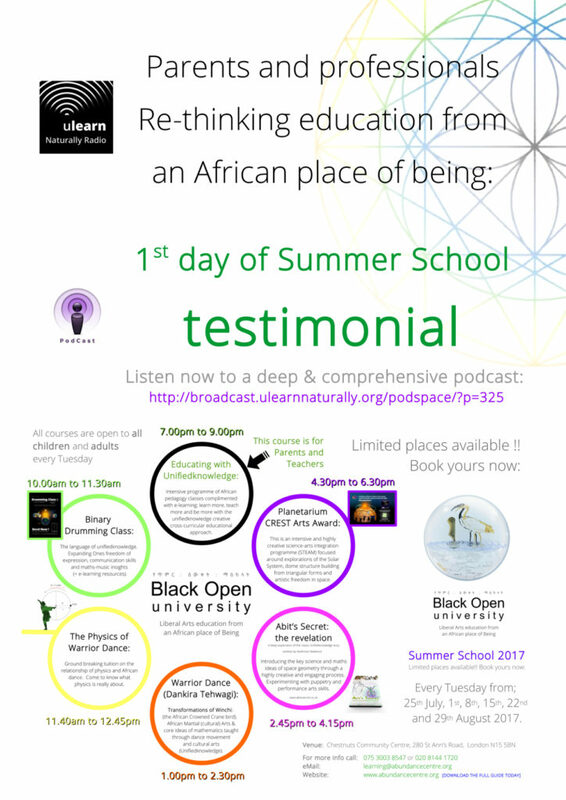 We have now started our Black Open University – Summer School 2017. Here is your chance to hear from one of the distinguished members of the learner-ship sharing and reasoning with Astehmari Batekun on the experiences and deep insights of this first day. 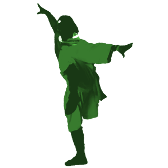 A profound reshaping of our space has taken place, watch it take form, or better still get involved and add your force to make it happen with even more perfect due brilliance. 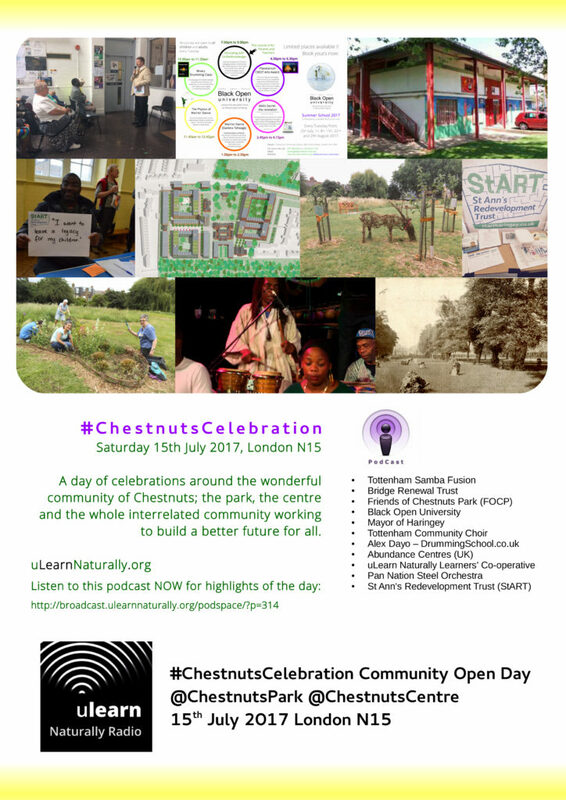 A day of celebrations around the wonderful community of Chestnuts; the park, the centre and the whole interrelated community working to build a better future for all. There were many organisations involved in the day, thanks for your presence and contributions, the community clearly valued all. Below are just a few of the ones featured in this podcast. Do contact the Bridge Renewal Trust and / or Friends of Chestnuts Park (FOCP) for more info. From complete beginners to performance players, drumming tuition to cater for everyone’s needs. 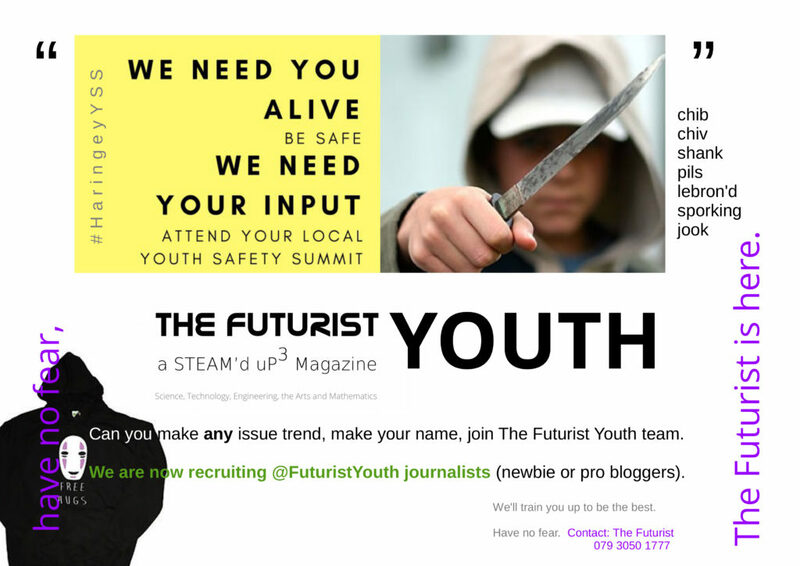 Cross-curricular, STEM, STEAM, integrated, family directed learning for all ages and stages..
StART is a group of Haringey residents and workers who want to see the St. Ann’s Hospital site used permanently for the good of all our local communities. 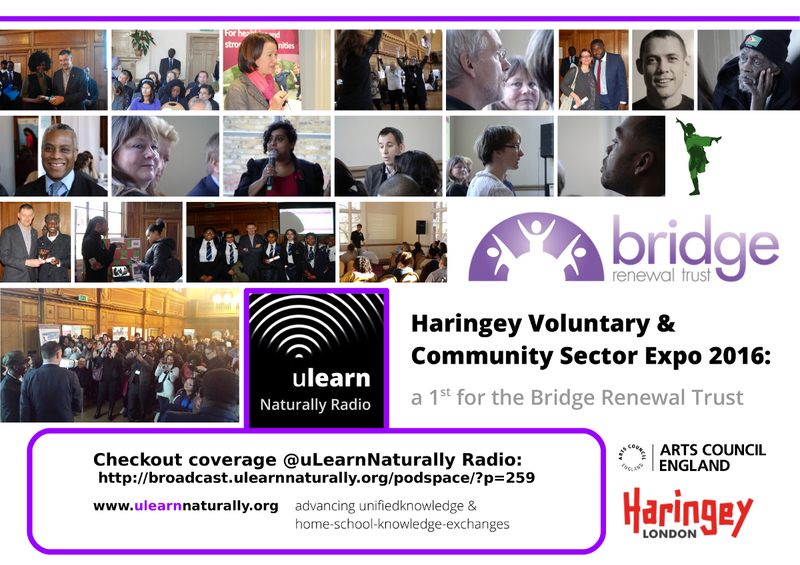 On Friday 25 November 2016 from 11.00am – 4.00pm the uLearn Naturally Radio team attended the Bridge Renewal Trust‘s 1st organisation of Haringey Voluntary and Community Sector Expo 2016. This very successful event took place at Tottenham Town Hall and there the outstanding work and achievements of Haringey’s community groups and voluntary organisations were showcased. The Bridge Renewal Trust in partnership with The London Borough of Haringey invited all to attend this annual public event and large numbers of the public and partner organisations from the voluntary, public and private sectors turned out en-mass. There was a mix of activities including exhibition stalls, panel discussions and awards to recognise a variety of achievements. 20 Streetz Ahead – health / physical act. Paul Bonham (Diversity Relationship Manager) from the Arts Council gave a very insightful workshop on Arts council funding. Panel members included Zina Etheridge, Deputy Chief Executive, Haringey Council, Dr Peter Christian, Chair of Haringey Clinical Commissioning Group, Steve Hitchens, Chair – Whittington Health and Sharon Grant, Chair of Public Voice and Haringey Healthwatch. Panel members include Cllr Eugene Ayisi, Haringey Cabinet Member for Communities, Catherine West, MP for Hornsey and Wood Green, Kristina Glenn, Director of Cripplegate Foundation and Islington Giving and Sona Mahtani, Chief Executive Officer of The Selby Trust. The day ended with a Community Impact Award ceremony, to recognise the outstanding work and achievements of community groups and voluntary organisations that have made a difference to the lives of Haringey residents. This was vibrant and very well attended. Highly commended: Group award – Y5 students from Tetherdown Primary School.